Romslig 3 soverom, 3 bad villa sover 7 i luftkondisjonerte rom. --- UTENFOR det har en stor hard dekk og et stort svømmebasseng som ligger i en acre av herlige tropiske hager fylt med Frangipani, Hibiscus og mangotrær. --- INSIDE, er det lys og luftig med en stor spisestue / stue, teak bord og komfortabel sofa og stoler. Det er innredet hele i en blanding av hard, sjøgress og moderne tekstiler. Stort kjøkken med ytterligere spisebord. UNDERHOLDNING: Dette er vår feriehuset så det er ideelt for familier med barn. Det er en stor HDTV, satellitt-og DVD-spiller, et leketøy boks med et godt utvalg av barn spill og leker, massevis av bøker og DVD'er pluss en swing og taustige i hagen og sykler for alderen opp til C9. BABY og småbarn utstyr aplenty inkludert barnevogner, bilseter, barneseng, barneseng, barnestol, baby badekar, potte og plast tallerkener / bestikk. Du trenger ikke å ta alt på flyet. Mullins Bay House ble nylig utstyrt hele i 2005. Møblene er en blanding av teak, andre hardtre og sjøgress. Det er også en stor mengde av baby og småbarn utstyr og barn leker inkludert: McLaren sportsvogn, høy stol, stellematte, potte, baby og småbarn bilseter, lin for barneseng og barneseng og plast plater / bestikk. Utenfor er det 3 sykler, en huske, taustige. Inne har vi massevis av bøker, spill og familien DVD-er. Innendørs håndklær - vennligst ta med eget strand / basseng håndkle. This was our second stay at this property.We enjoyed this spacious comfortable house -having breakfast on the veranda watching the green monkeys who often pass through the beautiful garden. We made use of the lovely pool-a really relaxing place to be. The location is great for us and the local Gibb’s beach was fabulous for snorkelling and sunset walks. We rented a car and so were able to explore a lot of the Island.Highlights for us this year were Stand Up Paddle Board lesson at sunset,diving with High Tides,snorkelling with lots of turtles and a visit to Hunte’s garden and the Atlantis Hotel for lunch on the east coast. The property is very well managed from the booking stage onwards and we were looked after well by the local managers. We look forward to another visit before too long. Lovely gardens in a great location! Property is in a great location only 5 mins to Mullins Bay! Spacious clean rooms with air con which was great. The pool and gardens are a lovely feature and the bbq was a welcome addition. Andrew and Oneta were extremely helpful and on hand when needed. Without wanting to sound negative in any way at all as we had a lovely holiday, we would definitely give 5 stars if the property was updated a little and we did all feel that a welcome pack ie a few teabags/coffee/milk/oil/s&p/water would be really nice (we had these at another property the previous year that wasn’t as nice as Mullins Bay House and it was a really nice touch) . It was good value for money and the location was perfect! a short walk to Mullins Beach. We couldn't fault the property it had everything we needed and it was so helpful to have all our baby equipment and car seats provided. Sarah and Simon were a pleasure to deal with and provided very detailed local information before we even set off. Andrew and Oneta looked after us during our stay and couldn't have been more helpful. We had a wonderful stay at the Mullins Bay House. The home was lovely and very comfortable, and you can’t beat the pool and garden area. We were lucky to have the entire property to ourselves, so that was FANTASTIC! We will definitely stay there again. Mullins Bay House has a unique and magical charm of its own - with a relaxed, homely feel - you can't help but unwind as soon as you arrive. The house is airy and spacious with everything you need for a stress-free break and its layout inside works wonderfully to give flexibility depending on how many people you are traveling with . The staff are incredibly respectful and helpful and keep the house and grounds spotless. 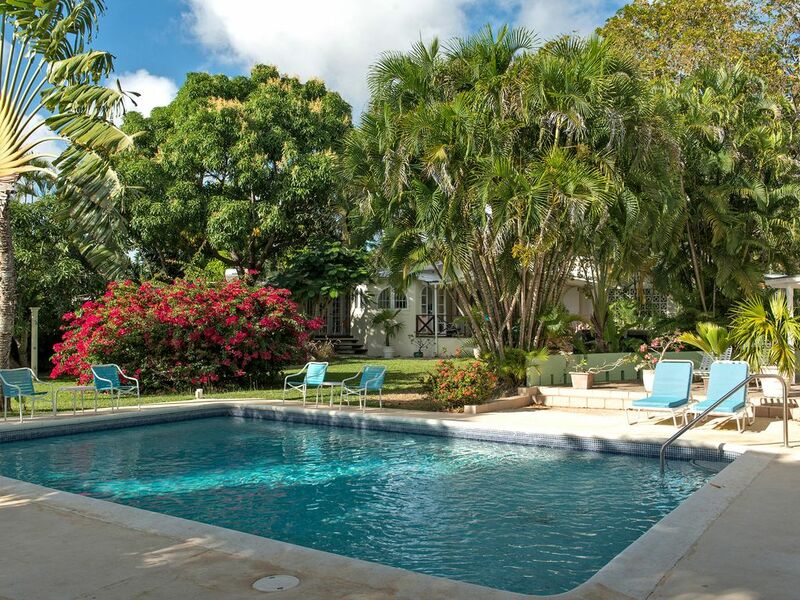 The house is set in beautiful gardens with a wonderful pool, with a great set of loungers and chairs close-by. There's plenty of natural shade under the palm and mango trees or on one of the many verandas which are also fitted with fans. The beach is just a 5 minute stroll away and close enough for a pre-breakfast swim. Local transport is a 5 minute walk too and local buses are regular and great fun to travel on with a fixed fare making life very easy! The local people are also so warm and welcoming and very helpful if you're not sure where to hop off! The location is also fantastic - not just for the beach and buses also as it's located between 2 great towns - Holetown and Speightstown which have banks, supermarkets and plenty of vibrant places to eat and drink. We loved the beach bars - especially JuJus on the way to Holetown and also the Bristol Bar in Speightstown for live music and sundowners. Smokey' s fish stall is just a few minutes drive away too and provides an easy and delicious supper for the BBQ. Sarah and Simon know the area and local people so well and are loved and respected by them. They are full of ideas on what to do and see and couldn't be more helpful and caring in making sure your stay is nothing short of perfect. In summary MB House is a little corner of paradise, set in lush gardens, with bird and monkey life all around, a beach at the end of the road and warm turquoise waters to swim in. All this plus the heartwarming and wonderful, authentic Barbadian vibe means it's a very hard place to leave! You're guaranteed to return home happy and relaxed and wanting to be back! This was our second time staying at Mullins Bay House. It worked so well for us the first time round we had no hesitation in booking again. There were 12 in our group, age range from 6 to 80 years old. The house offers flexible accommodation, generous beautifully kept gardens and a large swimming pool, perfect for a family holiday. The house is clean, comfortable and we were very well looked after by Andrew and Juanita. It's a great base to explore the Island from, everything is within easy reach, the beautiful West coast beaches, the wild rugged East coast and all the tourist attractions. Mullins Bay beach is a short stroll away where you can enjoy the lovely clear waters of the Caribbean Sea, a white sandy beach and sundowners at the beach bar. Highly recommended is a trip on a catamaran with Calypso Cruises, it's run by father and son, Nick & Val Knowles. The 5 hour lunch cruise offers an opportunity to swim with turtles, snorkel and explore shipwrecks, with the added bonus of delicious food and unlimited drink. We did the 3 hour sunset cruise this time which was also fantastic. There are many and varied eateries on the Island but if you want to 'eat in' the local fish markets are fantastic offering lovely fresh fish (from flying fish to lobster) and the roadside vegetable stalls have an array of local produce, perfect for a BBQ. So if you want a holiday lazing on the beach or by the pool with a rum punch in hand or a more active holiday exploring the Island look no further! Thank you Simon and Sarah for opening your house up for us to enjoy......again! Mullins Bay House ligger i løvrike og populære Peterskirken sognet Barbados med vakre strender flankert av palmetrær og fantastiske solnedganger over Det karibiske hav. ---- Mullins Beach Restaurant er 350 meter unna, og et flott sted for lunsj skuer over krystallklart vann. Convenience shopping er 800 meter unna sammen med 4 andre lokale spisesteder. --- Speightstown, den fargerike og travle nest største byen i Barbados er litt over en kilometer nord med et bredt utvalg av butikker, banker, barer og restauranter som Mangos og den berømte Fishermans Pub. ---- Holetown er 5 miles Sør med rundt 20 restauranter og barer, Duty Free Shopping og andre tjenester. --- Bridgetown hovedstaden er ytterligere 5 miles videre - og like bak det ligger de hvite sandstrendene i sør Coast. Andre Aktiviteter: Luxury Spa 300 meter unna. Rental rates are for up to 6 people sleeping at Mullins Bay House and include maid service. Additional adults are £100 per week, children £50pw. Arrive and depart on whatever days suit you - we have no fixed changeover day. All linen and bathroom towels included. Please bring your own beach towels. We have the 2 or 3 bedroom Garden Apartment available.